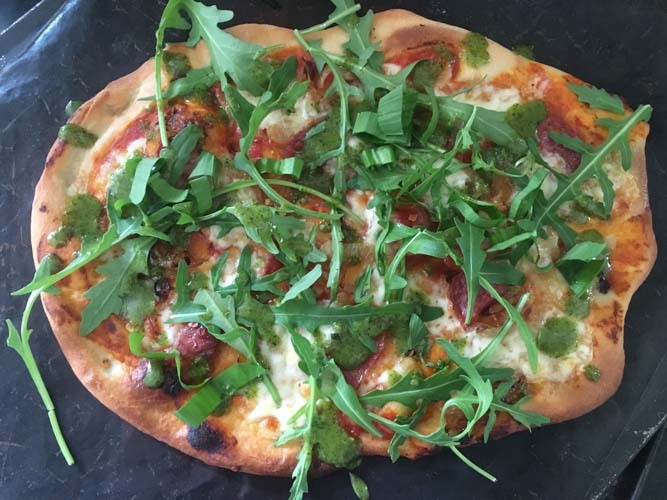 This entry was posted in Food and tagged Chorizo, pizza, rocket, salami, seasonal, supper, wild garlic by Anna. Bookmark the permalink. I like the sound of this but we don’t get much wild garlic here in Poland for some reason – wild thyme, wild sorrel yes, so think I might try this with these as a replacement. With regards to making your own pizza dough, we bought a German-manufactured ‘Thermomix’ that can do just about anything in one machine – relatively expensive to buy, but high quality and extremely versatile. Just bought a new barbie so will be interested to see your bbq chicken recipe and will try this out with your coleslaw! Do make it and let me know how you get on, or perhaps try the Camp Fajita recipe on your new barbie. You sounded rather calm about falling into the river. But all’s well that ends well with a whole load of wild garlic. Yes! Can’t stop with the wild garlic, already onto my second recipe today! Always lovely when you email arrives in my inbox, especially when it makes me laugh. A well deserved pizza for sure! Thanks Sam, I must say I did enjoy my pizza all the more following my dip!